This weekend I attended the Oregon NAME (National Association for Multicultural Education) Conference at Parkrose High School in Portland, Oregon. The first keynote speaker of the morning was Freedom Rider David Dennis (if you haven’t yet seen it, check out this excellent documentary – American Experience: Freedom Riders). 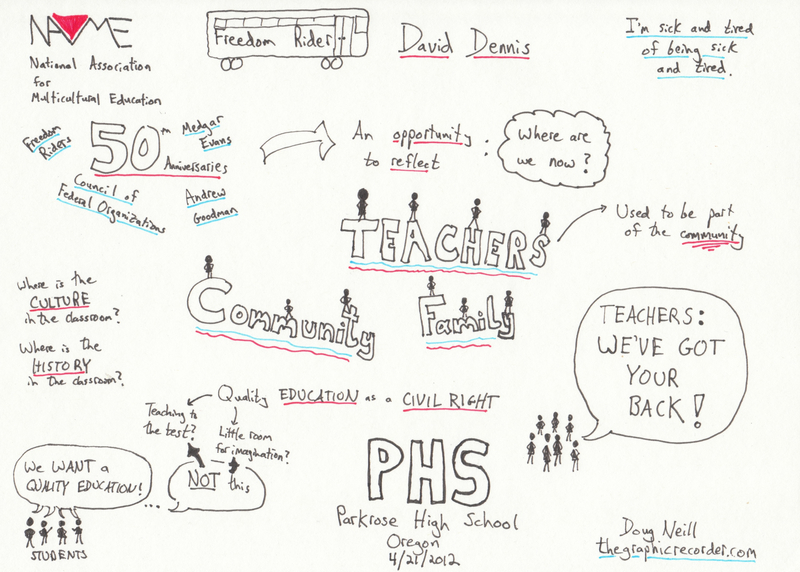 The sketchnotes above capture some of what Dennis discussed. Recent years have marked the 50th anniversary of many significant events in the civil rights movement, which provide us an opportunity to reflect. Dennis’ keynote address set the stage for the rest of the day by posing the question: Where are we now? Directing that question toward the education system reveals much work left to do. If you attended the conference, and particularly if you attended one of the break-out sessions led by Dennis, please feel free to add your impressions/reactions/take-aways from Dennis’ address in the comment section below.